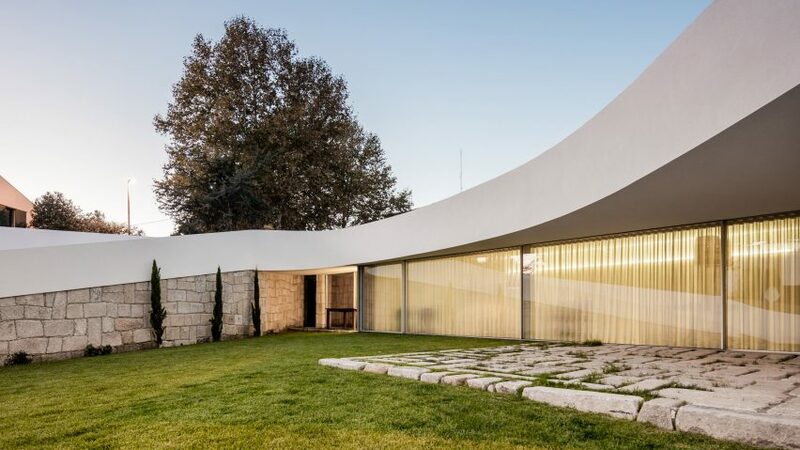 This house in Portugal, designed by architecture studio NOARQ, features a large curving canopy that wraps around a south-facing patio. 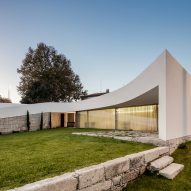 Casa ED&JO is a single-family house located in Vila Nova de Famalicão, a town north of Porto. 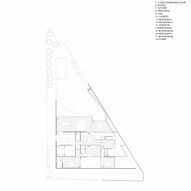 It sits on a site that slopes 7.6 metres from west to east, and which is bounded by roads on two sides. 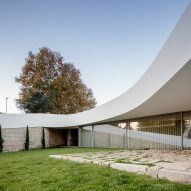 Retaining walls line the boundary of the plot, ensuring it is largely hidden from view, despite the proximity of the adjacent streets. 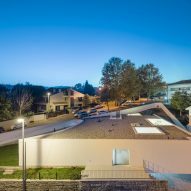 NOARQ, led by architect José Carlos Nunes de Oliveira, sought to maintain this sense of privacy. 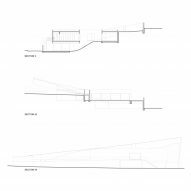 The team positioned the property on the widest part of the triangular plot, then created predominantly windowless elevations on the sides facing the roads and neighbouring properties. Instead, the majority of the glazing was added to the south and east sides of the building. 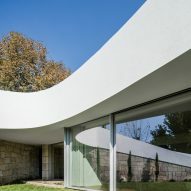 The southern facade incorporates full-height glazing and sliding doors that open onto a patio and garden, as well as providing a view of a swimming pool at the narrow end of the plot. 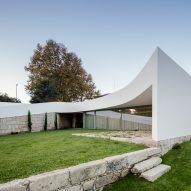 A curving cantilevered canopy shades the glazed elevation. 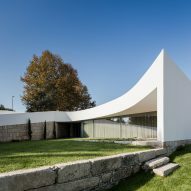 It sweeps around to meet a sloping retaining wall that further shields the interior from bad weather and prying eyes. 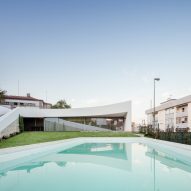 "The house is closed to the north for urbanistic and thermal reasons," said the studio. 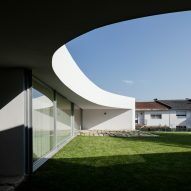 "This is also why the house is open to the east, where light enters the kitchen, and the whole of the south-facing front is open under a curved shade cover." 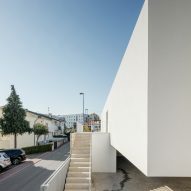 The property replaces a poorly constructed old house, which was entirely demolished except for a garage at street level. 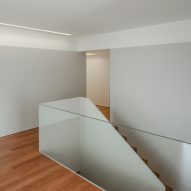 This garage was retained and expanded to create space for a storeroom and a hallway, providing access to stairs that ascend to the main living spaces. 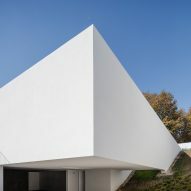 This western edge of the building is incorporated into the slope to ensure the house is completely hidden from the slightly elevated street on the other side of the boundary wall. Inside, the main level contains an open-plan lounge and dining area looking out onto the garden. 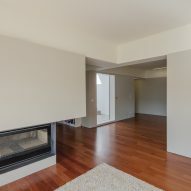 A partition incorporating a fireplace partially separates this space from an adjacent studio. 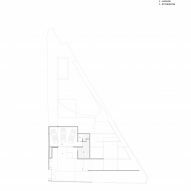 The living spaces are connected seamlessly by halls that lead towards the bedrooms in the more private northern part of the house. 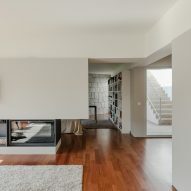 The consistent use of wooden flooring throughout unites these rooms. The kitchen and an adjoining laundry area are tucked away on the eastern side of the building. 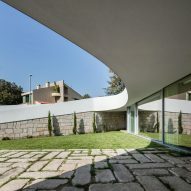 A glazed door from the kitchen opens onto a terrace connected to the garden. 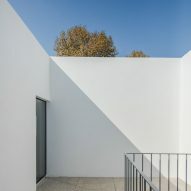 A series of four patios are punched into the crisp white volume, introducing natural light to the various rooms. 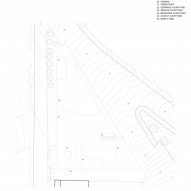 One of these openings incorporates an alternative entrance from the street on the western side of the property. 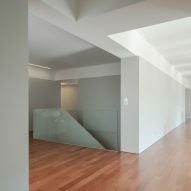 Others illuminate the master suite's bathroom and dressing room, the three bedrooms, and the kitchen and laundry room.